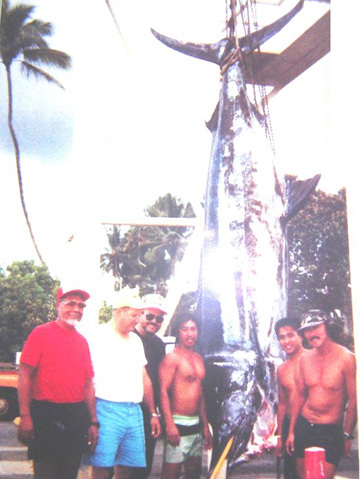 This monstrous marlin from the Haleiwa area of Oahu was caught by the crew aboard the LUCKY LIZ II with Capt. Alex Toki. The fish bottomed-out a 1,200-lb scale (it's head was still on the ground) and the captain decided he wasn't interested in cutting the fish in half at that point. They did, however, measure the fish and that is how the weight has been determined. It measured 19" 7" in length and 9' in girth.